Well… assuming we’re all still here and haven’t been “raptured” by the morning, here’s this week’s question of the week! Which products would you confiscate from your 16 year old self’s makeup bag?! I wouldn’t have confiscated it but I would have issused a distinct “Woah! There Nelly!” warning regarding my (over)use of black kohl. I spent a good 2 years of the late 90s looking like a startled Panda. I definitely would have confiscated all my germ-breeding foundation sponges that never saw even a speck of baby shampoo for many, many months. Who says teenagers aren’t completely disgusting? 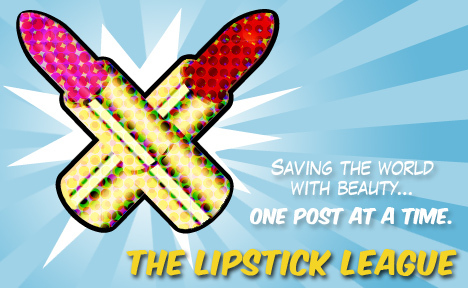 Here’s this week’s Lipstick League! Pink Sith – Knows the end is coming when she professes her love for a 2nd Clinique product, Pore Refining Solutions Correcting Serum! Phyrra – My Independent Spotlight for May is Geek Chic Cosmetics! Learn all about the people behind the company in this unique interview. Vampy Varnish – Get your glow on with Pixi Lumi Lux Radiance Powder. we heart this – MAC’s Surf, Baby! has a riding a beautiful wave, especially the Surf the Ocean Crushed Metallic pigments. Beauty Junkies Unite – shows you that the new Hello Kitty for Sephora “Memoirs of a Kitty” Collection isn’t for kids! The eyeshadow & blush palette is to die for. EauMG – This niche Hollywood perfume house will have you smelling like a 1950’s poolside pin-up with their Kitten. Meow! Nouveau Cheap – gives you an up-close look at the last of the three limited edition Summer 2011 collections from Wet n Wild: Inked (inspired by urban art culture). Orange to LA – is on her 4th container of LUSH Oatifix Fresh Face Mask. Find out why she’s smitten! Well, considering that I’m still 16, nothing! But I’ll probably regret wearing green and blue lipstick in public eventually, I suppose. Yeah, I’m going to say something about the powder. I had this habit of putting more & more powder throughout the day (to combat my oily T-zone) which used to make me look cakey.